I know Anthony’s going to go for a Chinese takeaway here. And why not? It’s (the wine) meant to be full of citrus flavour (always lends itself well to Asian cooking) and the acidity will help to manage the richness of the flavours and sauces. Some of us however, have got a wedding suit to fit into next week, so I’ve got to go down a slightly (but only slightly) healthier option. Given the minerality and again the acidity, the Aussie Riesling I’ve gone for is meant to be great with oily fish. As soon as someone says that to me I just think “Mackerel!” I’m an odd person, I know! So what I’m going to do is basically an open sandwich. Layer of toasted sourdough bread, then smear on some aubergine purée, a layer of roasted red peppers, then comes the grilled mackerel fillets, and topped off by a poached egg for a bit of added richness and some chive sprinkles. It’s like I’m bringing back “Can’t Cook, Won’t Cook”! I’m going to do the aubergine by just roasting it in the oven, then mashing it up with a touch of mayonnaise to purée it. The peppers will first be skinned, using the blowtorch I bought 3 years ago for a first nervous attempt at crème brulée. Then pop those in the oven too with a bit of oil and salt to soften up. The mackerel need to be filleted first. I cheated massively as there was a deal on pre-filleted mackerel as oppose to whole ones at the fish counter. But mackerel are seriously easy to fillet, and if in doubt, check YouTube! Not exactly glamourous, but I think it should be pretty nice. I’m cooking for 5 (don’t worry, we’ve got two bottles of the wine! ), so I reckon it’ll work out around £4 per person for that with most of the money, quite rightly, going on the fish. 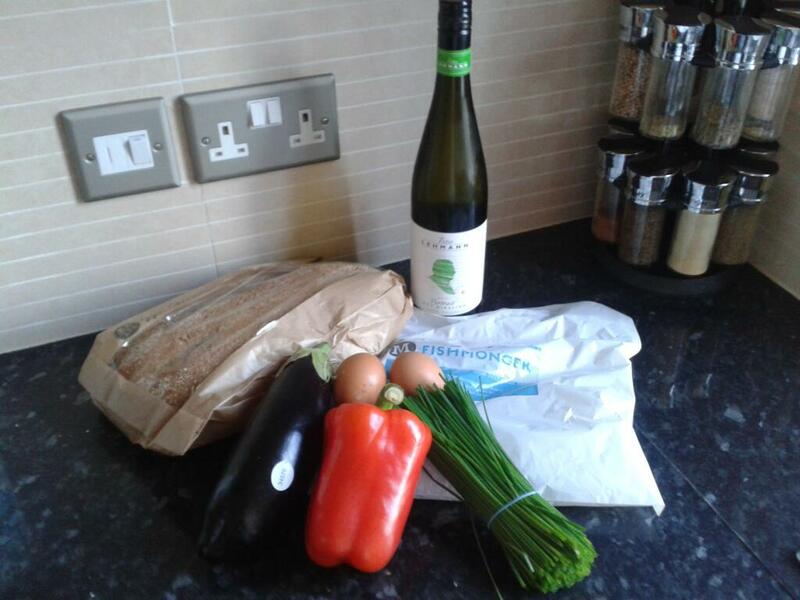 So as much as the main idea is to report back on the wine, I’ll let you know how the cooking goes. ← #NWTW Week 1: Put Them Together and You Get…Aussie Riesling!